A gusty wind and noticeable chill will arrive in the Garden State late Friday into the weekend, featuring some of the coolest temps of the season so far. Let's clear up some "meteorological mumbo-jumbo"... A "cold front" is simply the leading edge of a cooler, drier air mass. The character of the old and new air masses dictate what happens to our weather forecast as a result of the front. In this case, both our current and impending air masses are very dry, so the chance for rain will be very low as the front arrives Friday. The new air mass, however, carries much colder air than the old. 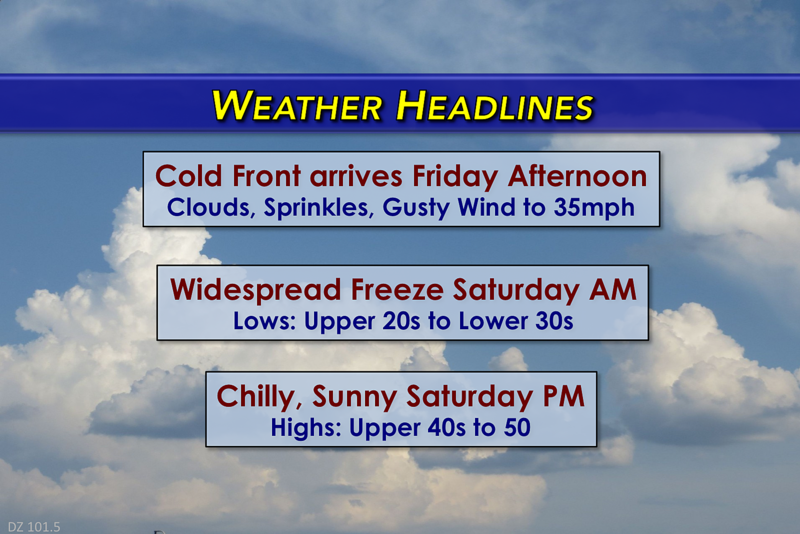 So expect a definite chill in the air for the beginning of the weekend. The first half of Friday looks fine. Early morning temperatures have been in the 40s, and we'll see high temperatures near 60 degrees around lunchtime. Our front arrives sometime Friday afternoon. You'll know it's coming once you see a band of clouds approaching overhead. Again, rain chances will be minimal. But I'm not going to rule out a sprinkle as the cold front forces air upwards, where it may condense into a raindrop or two. The bigger effect of this front will be a fierce northwesterly wind that will increase sharply from late afternoon into Friday evening. Gusts to 35 mph will begin carrying colder air into our atmosphere through Friday night. Saturday morning is likely to be our coldest morning of the season so far, as low drop into the upper 20s to lower 30s. Almost all of New Jersey will experience a freeze overnight - including parts of the NYC urban corridor that have not frozen yet this season. Luckily, winds will lighten up before sunrise so a bitter "wind chill" is not a concern. Saturday is going to be chilly overall, despite bright, sunny skies. Highs are expected to only reach the upper 40s to around 50 degrees Saturday afternoon - about 10 degrees below normal for mid-November. Winds should be fairly light during the daytime hours (10 to 15 mph). By Sunday morning, winds will shift from northwesterly to westerly. And so, our air mass will moderate accordingly. Highs for Sunday are forecast to bump into the upper 50s to near 60 degrees. Much more comfortable and much more seasonable, with continuing sunshine. In fact, I think Sunday will turn into a very nice mid-November day. Our weather looks to stay quiet and mild on Monday, with partly sunny skies and highs mostly in the lower 60s. Tuesday looks OK too, although a wind off the ocean will increase clouds and cause temps to be a few degrees cooler compared to Monday. Our next storm system is a coastal storm scheduled to arrive late Tuesday night into Wednesday, and it could bring some significant to New Jersey. 'Tis (almost) the season when coastal storms can cause some big winter weather. But it looks like temperatures will stay well above freezing through the duration, so we're talking about all rain. And it could be quite a bit of rain, especially along the Jersey Shore - 2+ inches, maybe? Confidence is pretty low for such a storm system this far out, as there's lots of time for the track to evolve and wiggle. We'll be able to put finer details on this forecast by early next week.